1. A Father is neither an anchor to hold us back nor a sail to take us there but a guiding light whose love shows us the way. 2. A Father is someone you look up to no matter how tall you grow. 3. Any man can be a Father it takes someone special to be a Dad. 4. My Father didn't tell me how to live, he lived and let me watch him do it. 5. Dads are most ordinary men turned by love into heroes, adventurers, story-tellers, and singers of songs. 6. The righteous man walks in his integrity. His children are blessed after him. 7. A Father's love warms the hearts of his children forever. 8. A truly rich man is one whose children run into his arms when his hands are empty. 10. 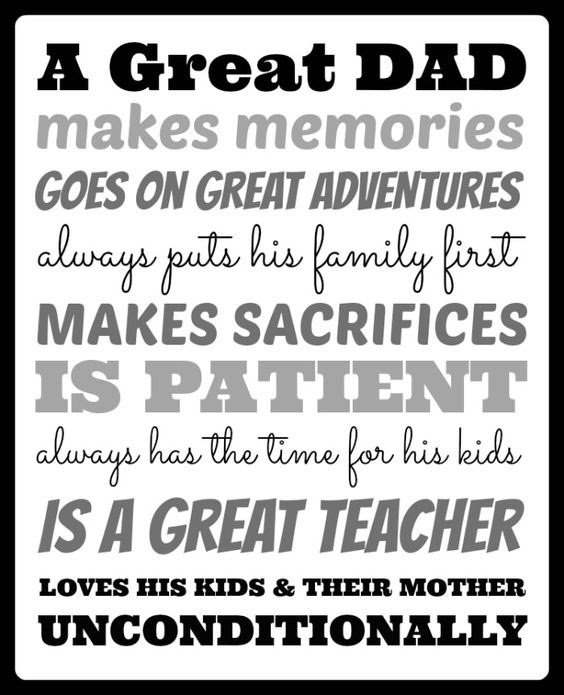 A good Father is one of the most unsung, unpraised, unnoticed and yet one of the most valuable assets in our society. I am addicted to quotes...hope you enjoy them as much as I do. Good morning Richard and Beth. All good quotes, but number nine rings especially true. Enjoy your day! Good morning Beth and Richard. Nice job here. Richard, I wish you a Happy Father's Day if it applies. Richard and Beth Witt great quotes! Happy Father's Day to you too.